A petition is being raised to the Scottish Parliament seeking to improve testing, treatment and awareness of Lyme Disease and other tick-borne illnesses. It�s an important issue to climbers and walkers, who are particularly exposed to ticks through the summer months and a post on Mountaineering Scotland�s Facebook page received almost 190 shares in the first 24 hours, with a total reach according to FB stats of over 42,000 people. The petition to the Parliament comes from Janey Cringean and Lorraine Murray on behalf of Tick-borne Illness Campaign Scotland. The campaign argues that many patients in Scotland are being failed by current medical practice regarding Lyme Disease (also known as borreliosis) and other tick-borne co-infections. If the disease is caught early, patients recover with standard treatment, but 10-20 per cent of patients go on to develop a debilitating chronic condition. 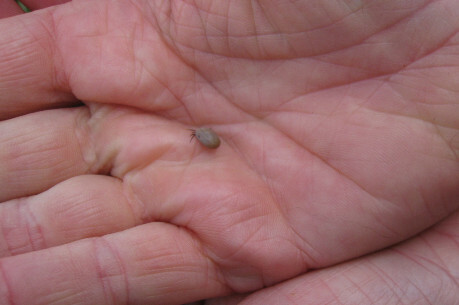 On average, five per cent of ticks in Scotland are infected with borrelia. The number of cases of Lyme Disease in humans has increased in the last decade: in 1996 there were fewer than 30 new cases in Scotland; in 2015 there were around 220. However, GPs estimate that only 20-40 per cent of cases are referred, and so the numbers are likely to be much higher. There are numerous issues with testing and diagnosis and tests currently used are held to be unreliable. Currently there are no tests which cover all tick-borne infections found in Scotland. The current guidelines used for treatment in Scotland were developed in 2006 by the Infectious Diseases Society of America (IDSA) but are now considered in America to be out of date. Recent research has shown that the bacterium which causes Lyme Disease forms dormant �persister� cells, which are known to evade antibiotics. Borrelia has been described as "one of the most complex bacteria known to man". Treatment protocols need to be modified to address the complexity of borrelia infection. Current treatment normally involves antibiotics for up to one month, but this regime does not acknowledge persistence of borrelia infection, or the presence of possibly multiple co-infections. It is argued that treatment should be extended for as long as symptoms persist. In terms of awareness, the campaign wants doctors to be taught to recognise a collection of symptoms of Lyme disease, many of which mimic other illnesses. It says education should also extend to the public, so that they are more aware of the dangers and have information on how to protect themselves. One example of how this could be achieved is given as landowners being required to display suitable warning notices at visitor centres and car parks. The closing date for the online petition, which you can sign here, is 28 June 2017. Read more about ticks and how to avoid or remove them.